Even as it battles it out with Uber in the ride-hailing space, Ola’s once again shown that it’s looking to expand its wings across India’s entire mobility sector. 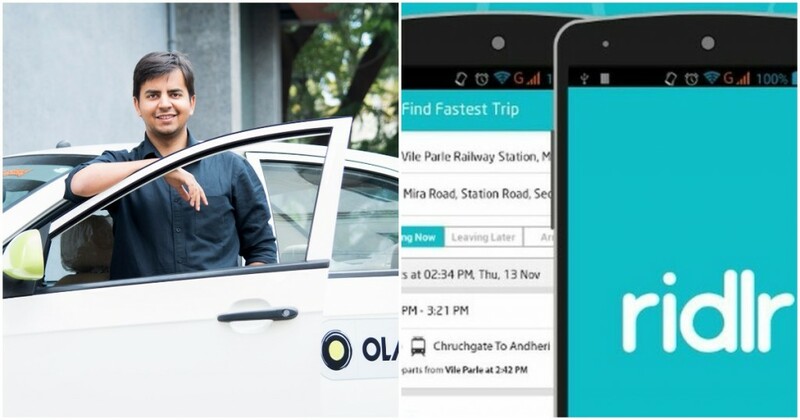 Ola has confirmed that it has acquired Mumbai-based urban transport app Ridlr. Ridlr had attempted to help people navigate India’s public transport, providing live traffic updates and bus timetables, and also letting its users buy bus tickets in 17 cities. Ola says it will continue to run Ridlr as a separate entity, and hasn’t disclosed the price of the deal. Ridlr, for its part, had been an established startup in the transportation space — it had been founded all the way back in 2010, and had raised over Rs. 40 crore from marquee investors including Times Internet and Qualcomm Ventures and Matrix Partners. Matrix Partners is also an investor in Ola. But Ridlr’s acquisition has shown that Ola does seem to be committed to owning the entire mobility space in India. Even as Uber seems to have limited its focus on its cab-hailing business in large Indian cities, Ola has been experimenting with all sorts of transportation options. Like Uber, it runs its bike taxis, but had also tried out a mini-bus service through Ola Shuttle, and is even looking to launch a water ferry service in Guwahati. While Uber had paused its autorickshaw hailing feature a few months after launching it, Ola had stuck with its own autorickshaw service for years, and recently forced Uber to enter the space again. With Ridlr, Ola can aim to own a doorstep-to-doorstep transportation service across Indian cities. Ola already has an option on its Ola Share service which allows users to board a cab from a point slightly far away from them for a cheaper fare — with Ridlr’s data on traffic patterns and public transportation services, it could give its users a holistic view, showing them the best ways to combine both public transport and Ola’s services to reach their destinations quicker and cheaper. Ola now owns Foodpanda as well, and could use Ridlr’s traffic data to help its delivery personnel how to reach customers faster. It still remains to be seen how the acquisition will play out, but Ola’s certainly signalling that it aims to be a large mobility player in India and abroad — it’s recently launched operations in Australia. This large portfolio could be handy during Uber and Ola’s merger talks. It has been reported that Softbank has been asking Uber and Ola to join forces, but the two companies are unable to agree on who will retain control of the combined entity. If Ola has a larger and more diverse portfolio of services than Uber — and at the moment it does — that could give it more leverage as it aims to acquire Uber India, as opposed to Uber India acquiring Ola. And with Ola now running in far more cities in India than Uber, and having a bigger mobility portfolio than Uber, it’s looking increasingly likely that Ola could end up being the only player in the space in India in the months to come.